Whenever we are at a natural food show, Tony always gravitates toward the KIND Bar booth. His diet is a little more restricted than mine, and those nutty noshes offer him the perfect fuel for long days on our feet. But really, aren’t they just trail mix “glued” together with honey or agave? I think it’s about time to make some homemade Kind Bars, don’t you? Surprisingly, many varieties of Kind Bars contain dairy, including their ever-so-appealing Dark Chocolate Cherry Cashew bar. To remedy that issue, these homemade Kind Bars are an even better tasting replica, packed with antioxidant-rich tart cherries, dairy-free chocolate chunks, and protein-rich nuts and seeds! 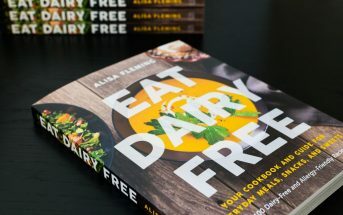 By ingredients, this recipe is dairy-free / non-dairy, egg-free, gluten-free, peanut-free, soy-free, vegan / plant-based, and vegetarian. Just use caution in the chocolate and cereal that you choose, to keep these homemade Kind bars safe for you. For the full “chocolate chunk” effect, I recommend using Enjoy Life Chocolate Chunks. As for the cereal, Erewhon Gluten-Free Brown Rice Cereal is a good option, but your favorite puffed cereal (even millet!) should work well. 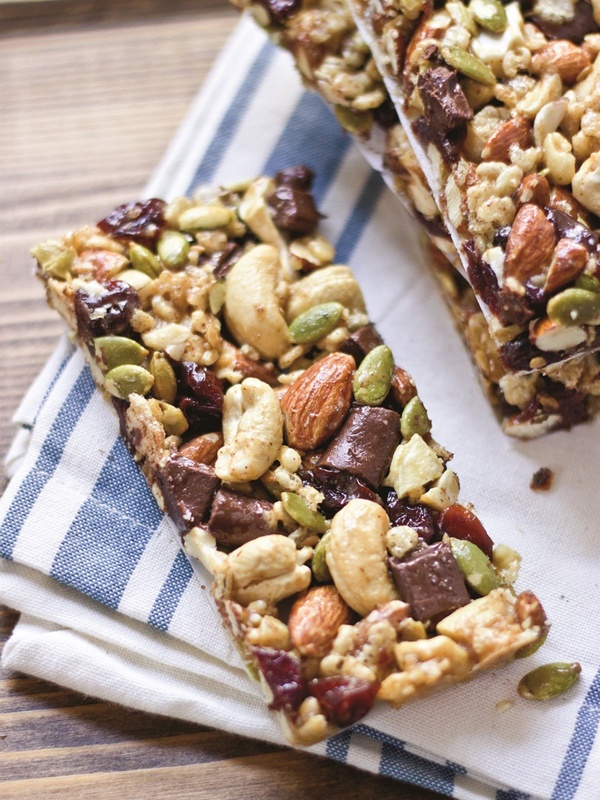 For nut-free homemade Kind bars, you can substitute the almonds and cashews with your favorite seedy blend, more rice cereal, and/or some oats. Swap the almond butter for sunflower seed butter. 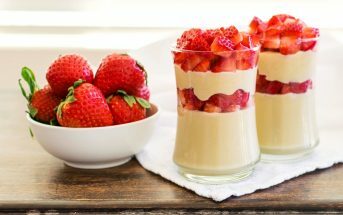 This recipe was shared with us by Choose Cherries ~ the Cherry Marketing Institute. Preheat your oven to 325°F. Line an 8x8-inch baking pan with parchment paper. In a large bowl, stir together the nuts, cherries, cereal, seeds, chocolate, and flaxseeds. In a small bowl, whisk together the syrup, almond butter and salt until combined and gently fold into the dry mixture until completely incorporated. Transfer the mixture to your prepared baking dish, and use another sheet of parchment paper to evenly press it into the pan..
Bake for 15 minutes. Allow the bars to cool completely in the pan on wire rack. Place in fridge or freezer for faster cooling. Pull up the sides of the parchment paper to remove the bars and turn upside down onto a cutting board. Peel off the parchment paper, and using serrated knife, slice into 10 even bars. Wrap each bar individually with plastic wrap and store in an airtight container on the counter up to 5 days or in the fridge up to 2 weeks. Hi Aliza, My question is: if you mix all ingredients as directed, how do the nuts come right on top and the creamy stuff in bottom? Is there a step missing? Hi Levana, there’s no creamy stuff on the bottom, those are cut sheets of paper. It looks like it though! This is my second time making these bars and they have turned out perfect both times! My husband loves them and they are so easy to grab and take to work. 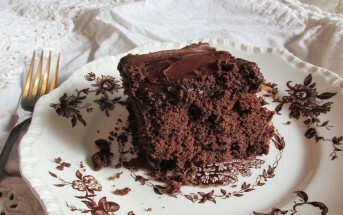 Thank you for this recipe, as someone else mentioned, they are on the Christmas baking giveaway list! Fantastic! Thanks so much for sharing your feedback Karen! This are the BEST BARS I have ever made. They look and taste fantastic! I did put mine in a loaf pan instead of the cake pan and then I put the parchment paper on top of the bar and pressed down all over the top with a bottom of a glass to help make them firmer. That’s awesome Nancy! Thank you so much for sharing your feedback and tips. 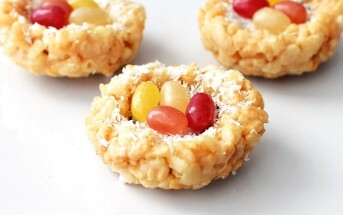 I am stoked to try making these… I think I will put in popped amaranth for the puffed cereal… I love Kind Bars! I have made these bars three times now. They are GREAT! I will be adding them to the Christmas goodie bags I make as gifts. ? these are beautiful! I love the combination, cashews are my favorite. I love everything about these bars. Pinned and shared! These look AMAZING, and exactly what I have been trying to find! Pinned, and saved! Thank you! YUMMMMY! These bars tasted great, but they fell apart on me. I used agave and kept the cashews and almonds whole, since they looked like they were whole on the picture. Is agave a poor substitute for brown rice syrup? Hi Peggy, it isn’t a “poor” substitute, but it is a little less sticky. i LOVE making copycat kind bars but never tried the chocolate/cherry combo! Gorgeous pictures! Stunning photos! I’m usually not a big fan of this style of bar, but I want to give it a try based on the pictures alone. Indeed! These are just too easy to pass up!